You may be wondering what sets our products apart from the rest. Couch Defenders and Chair Defenders are harmless to your dog. This was our number one priority when designing our products. They do not scare or cause any discomfort to your dog. The products simply take up the area on your furniture, leaving no space for your dog to climb up. Unlike other products on the market, Couch Defenders and Chair Defenders stop your dog before they get on the furniture. Our patented design includes end panels that keep the product securely in place, preventing your dog from moving it out of the way. If you thought it couldn’t get any better, making our products safe for your dog did not come at the expense of practicality. Couch Defenders and Chair Defenders are convenient to use every day. They are light, easy to open and close, and easy to store. Couch Defender, Inc. is a company based in Kissimmee, Florida. 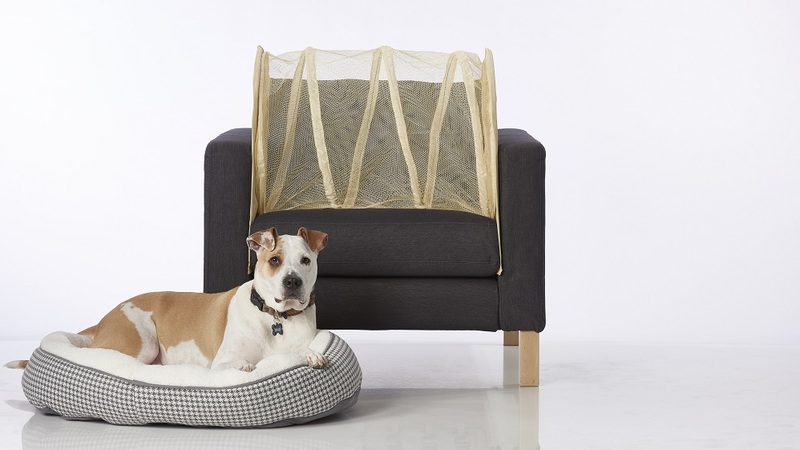 Our company’s mission is to provide convenient and affordable furniture protection for all dog owners. After years of stacking books, baskets, and brooms on our own furniture, we decided we needed a better solution. That was when Couch Defender, Inc. was born. As a company that can relate to our customers, we are committed to providing quality products that get the job done. We love dogs. Our dogs. Your dogs. Just all dogs. And while the love we have for these four-legged friends is never-ending, we don’t want our furniture to pay the price. Couches and chairs can become scratched, torn, or taken over by hair. Using Couch Defender, Inc. products provides a solution to those problems, which provides you with peace of mind. Stop worrying about your dogs jumping up on your furniture when you leave the house. We’ve got you and your furniture covered. Thank you so much for sending our Couch Defender!! We just bought a new couch and its sitting right in front of our windows, which also happens to be our 2 Labs favorite place to perch and “guard” our home between naps. I was determined for this new couch to not fall victim to their licking and excessive hair. I tried everything and NOTHING worked to keep them off…I met Kathy and she suggested the Couch Defender. I am happy to report it has worked wonders for us and our furbabies!!! We LOVE LOVE LOVE your product!! Everybody that has seen it has vowed to buy one for somebody they know for Christmas! Thank you for making our home less stressful for all of us!! We have 5 Cocker Spaniels and brand new furniture…not the best combination. We looked at various possibilities for keeping the dogs off the furniture but nothing seemed to make sense. We had allowed them on the furniture in the past so they were confused. Then we ran across Chair Defenders! What a gift from heaven. Extremely simple to use. Easy to store when you want to use the chair and, most importantly, 100% effective. We have not had a dog in a chair since we started using them. When collapsed they are small enough that we store them in a closet when we have guests. I had reason to communicate with the company and they were extremely prompt in replying. Customer service is a big plus with me. I can, without equivocation, recommend the Chair Defenders to anyone that wishes to keep their pets off the chairs. I just wanted to tell you the Couch Defender was shipped lightening fast. I am extremely satisfied and at last our couch stays clean ! Your product is perfect. I was a little hesitant about spending $35 on this product, especially because other products failed to keep my French Mastiff off of our couches. We had tried using a product that would make a loud noise when my dog would go on the couch. It was USELESS, she would care less about the sound and move the device out of the way. The Couch Defender is a whole new animal though! I cannot express my happiness any more for this unique product. Since first using it my dog has not even attempted to go on the couch. She is now so used to sleeping on her bed (on the floor), that even when the Couch Defender is not on the couch she still does NOT go on them! Amazing product, there’s no way it won’t work for you! Just be consistent, always put in on your couch when you leave! Good luck!!! This works! We bought this when we bought a new sofa for our living room. With 2 dogs running in and outside all day, if we didn’t have the Couch Defender, I’m not sure our new sofa would still look so new 1 month later. Both of our dogs have tried pulling the Defender off the couch and neither one has figured out how to do it. The Couch Defender really does work. I purchased a chair defender to protect my mother’s chair from her 100 lb. bull-headed, eat anything (wood, leather, walls) yellow lab, Charlie. I had my doubts. I was concerned that Charlie would grab it with his teeth and pull it off and devour it but your product is quite sturdy and stays put. My mother is very pleased with the chair defender! Yes, it works! What all the great reviews say…and in fact I am going to pick up two more for the bed and use them side by side! For my canines that previously RULED the furniture, this is perfect! I was originally planning to do a video review but my Boxer has managed not to go near my couch since I put it on. Unlike the Sofa Scram, I actually placed this one on the couch while my pup watched. I ran my camera like normal to see how he would interact with it. Once I got home and reviewed the footage, the most he had done was walk up to it, sniff, then walk away. It’s not the most attractive thing to look at, but it definitely solved the problem and is quite easy to put away. © 2018, Couch Defender Inc. All Rights Reserved.